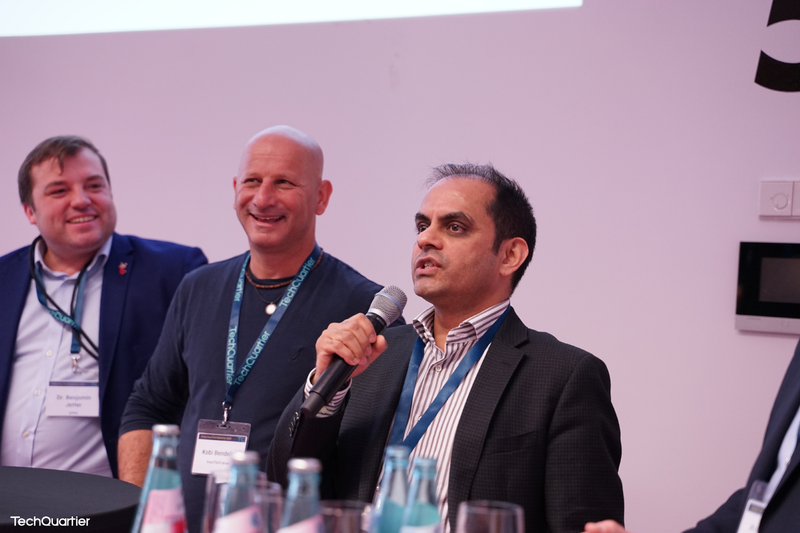 Following the success of the Global InsurTech Roadshow in 2018, Dr. Moritz Finkelnburg’s unique startup event returned to the Goethe University Frankfurt for a second time running. With over 250 participants, the two-day conference presented an optimal opportunity to network and match-make, bringing together promising tech startups, experts from the insurance industry, as well as international regulators and policy-makers. Once again, we gave special attention to a specific country’s ecosystem, deciding to collaborate with Israel for the 2019 edition. We kicked off the event with our international pitch competition, featuring 21 startups in the running. Up first, we heard from Kovrr (Israel), Botfriends (Germany), Go InsurTech (Israel), Anivo (Switzerland) and Tiidan (Israel), who provided innovative risk assessment and chatbot solutions. After a quick coffee and conversation break, Mitipi (Switzerland), Insurdata (United Kingdom), Smart Insurance Inc. (Macedonia), Motion S (Luxembourg) and Gefen (Israel) presented their business models. Given the fantastic weather conditions, we proceeded to enjoy a long lunch in the sunshine before retreating indoors for our final two pitch sessions: firstly hearing from a variety of health and life insurance focused startups, including AirDoctor (Israel), Bodylabs (Germany), Serenus AI (Israel), Atidot (Israel), Vlot (Switzerland) and Ewa (Germany). This round was moderated by Stephen Voss of Neodigital, a participant in last year’s roadshow, demonstrating the immense evolution that can occur from one year to the next. The competition drew to a close with presentations from Hepster (Germany), Yous (Israel), Wetterheld (Germany), FloodFlash (United Kingdom) and Skyglyph (Bulgaria). With the pitches completed, Dr. Moshe Bareket, Director General of Israel Capital Markets, and Kobi Bendelak, Founder & CEO of InsurTech Israel, shared their knowledge and expertise in an engaging panel on Isreal’s InsurTech ecosystem, citing social responsibility as a key lesson to take away. To wrap things up, Dropin, Trumyle and Nect proudly reported their personal growth and financial successes since participating in the roadshow last year. Finally, after indulging in a well-earned Äppler and delicious dinner, Gabriel Bernadino, Chairman of the European Insurance and Occupational Pensions Authority, gave a talk and the TechQuartier Insurtech Prizes were presented. AirDoctor (Israel) took home first place, with Yous (Israel) and Insurdata (United Kingdom) coming second and third respectively. Bodylabs (Germany) received the Aon Award, and all the winners were gifted a TechQuartier membership by our Managing Director Sebastian Schäfer. On day two, we were welcomed with more sunshine, as insurance experts discussed the latest digital trends in cyber, blockchain, and artificial intelligence, followed by the Regulators Talk and a digital insurance strategy discussion. The CyberInsurance panel, lead by Ute Richter (Digital Hub Cybersecurity), Christan Nern (KPMG), Shalom Bublil (Kovrr), Ole Sieverding (Hiscox) and Constanze Brand (SwissRe), was particularly engaging, illicting moments of laughter and many follow-up questions from the audience. Discussion points included the future of cyber and potential risks to the insurance industry, with speakers highlighting that, due to the rise of new business models, cost-effective systems, analytics, and predictive technology, businesses are expected to become more and more digitalized. It was noted that, thanks to increased usage of wearables and corresponding familiarity with these products, feedback had emphasized the importance of improving cybersecurity in consumer offerings. Further ideas were exchanged regarding the insurance of low-tech companies. As new technologies are constantly being introduced, engaging with the ‘shift of [digital] culture’ was identified as the first step for small businesses. The insurance sector was thus presented as having no choice other than participate in digitalization when deciding on whether to engage with other companies. ‘Cyber insurance is the most promising, fastest changing product of insurance… Be willing to change and adapt fast if you swim in that pool,’ stated Constanze Brand, SwissRe. 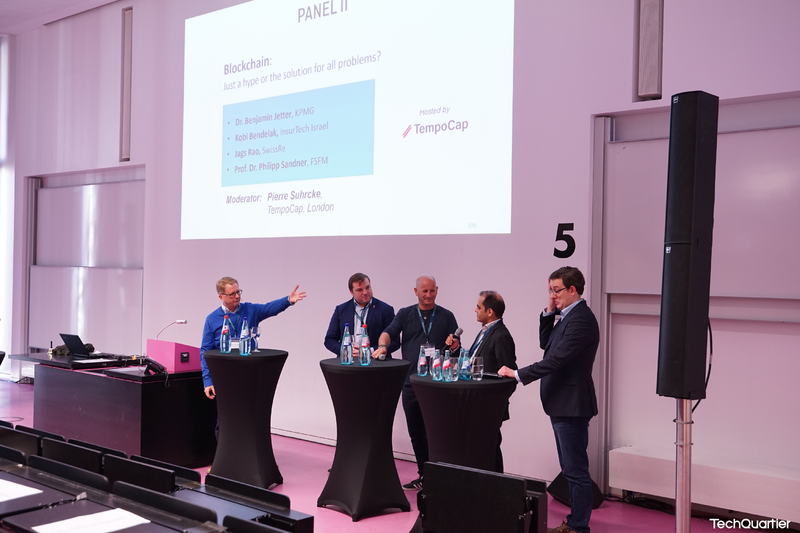 Next, we heard from Dr. Benjamin Jetter (KPMG), Kobi Bendelak (Insurtech Israel), Jag Rao (SwissRe) and Prof. Dr. Philipp Sandner (FSFM), who evaluated potential Blockchain developments across Europe. Discussions ranged from the ‘hype’ surrounding cryptocurrencies to the use of Blockchain as a distribution channel in insurance, with all parties agreeing that large scale coverage should not be expected within the near future due to current political and business environments. The Artifical Intelligence panel, presented by Oscar Maciaga (Force Manager), Claire Sévin (Getsafe), Bartek Maciaga (KPMG), Dr. Thomas Jansen (Heuking Lawyers) and Dror Katzav (Atidot), addressed the extraordinary proliferation of AI, its integration into our day to day lives, and potential causes for concern. A reduction in the price of data and hardware was identified as the main driver of current developments within the field, and potential uses in insurance included fraud detection and claims processing. 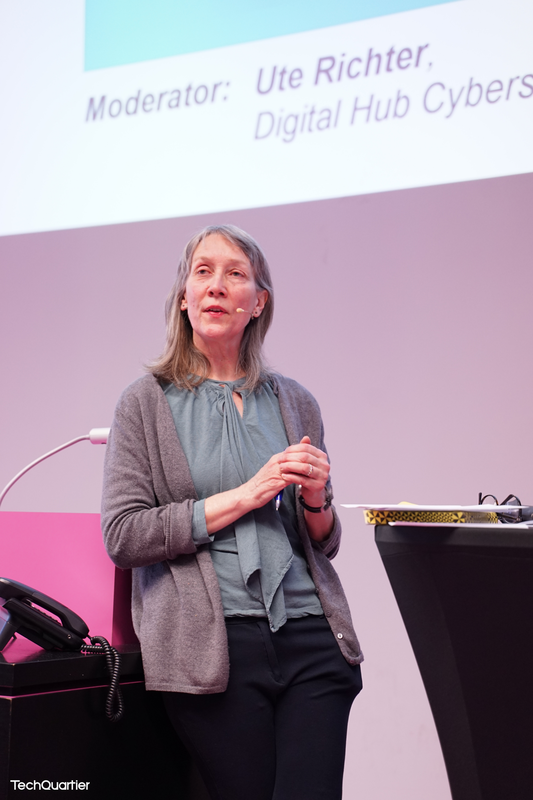 The speakers concluded that, while it is impossible to predict exactly how AI will impact business in the next 15 years, we can expect it to have ‘a drastic effect on our daily life’. After lunch, we gathered together for the Regulator‘s Talk, featuring Dr. Frank Grund (Executive Director, Federal Financial Supervisory Authority), Prof. Klime Poposki (President Macedonian Regulatory Authority), and Dr. Moshe Bareket (GM Capital Market, Insurance and Saving Authority Israel). Main topics included the simplification of FinTech/InsurTech regulations, intervention approaches during market failure for future strategy, moving away from old regulation methods and moving into new ones (i.e. blockchain), monitoring the value chain and understanding products, as well as forcing insurance companies to share data. It was concluded that adjustments in regulation would be required in order to move forward with future technological developments. 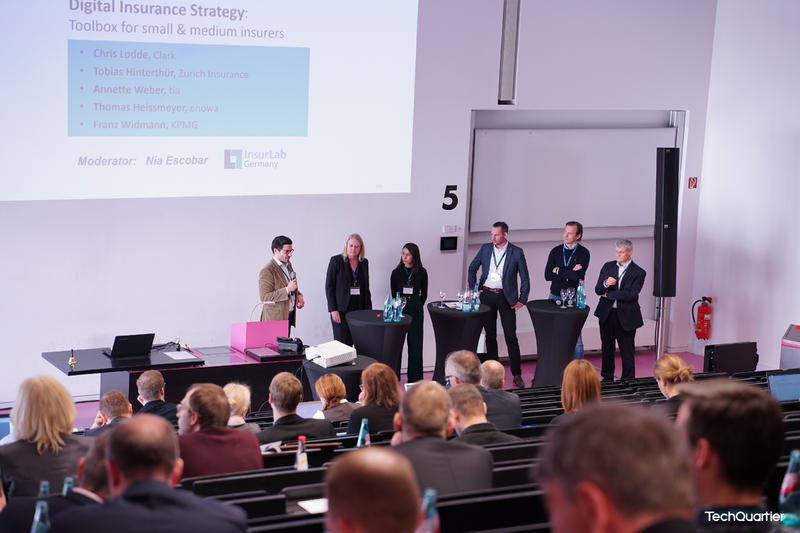 The final talk of GIR19 was ‘Digital Insurance Strategy: Toolbox for small and medium insurers’ which welcomed Chris Lodde (Clark), Tobias Hinterthür (Zurich Insurance; Insurance Lab), Annette Weber (Tia), Thomas Heissmeyer (Enowa), and Franz Widmann (KPMG). Each of the guests shared their perspective on today’s digital strategy, providing an insightful and informative end to this fantastic two-day conference: ‘Get out there, learn from other industries’ best practices, focus on consumers and don’t be afraid to fail’. We would like to thank all the attendees for their brilliant participation, and in particular Founder and Chairman Dr. Moritz Finkelnburg, without whom this event would not have taken place. We cannot wait to continue the tradition in the years to come.